Home » Animals » Picture Books » Reviews » Reviews by Susan » Susan Whelan » Wordless Picture Books » Review: Follow the Firefly + Run, Rabbit, Run! Review: Follow the Firefly + Run, Rabbit, Run! This wordless picture book features two stories. 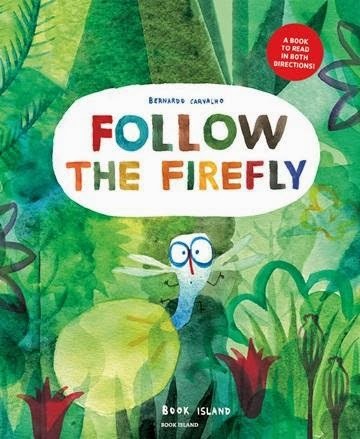 Reading from front to back, children follow the firefly as he looks for a flashing light. He journeys through the jungle, getting directions along the way from different animals, until he reaches his destination. On the final page, where the story would normally end, an illustration shows several animals in cages on the back of a truck. One breaks free and the challenge is now on to follow the rabbit. Retracing their steps back through the book, children read from the back to the front and discover that in each illustration, rabbit is also present. Chasing him is a dog determined to find him and bring him back to where he belongs. Will he succeed? Originally published in Portugal in 2013 with the title(s) Olhe, por favour, não viu uma luzinha a pizcar? / carre, coelhinho, corre!, Follow the Firefly/Run, Rabbit, Run! is the creation of Portuguese author/illustrator Bernardo Carvalho. Young children will enjoy spotting the firefly, rabbit and dog in each double page spread as well as the novelty of reading a book backwards. Follow the Firefly / Run, Rabbit, Run! is ideal for encouraging children to create their own story prompted by the illustrations.